What is a music composer? Composers create all of the background music that plays throughout the game. 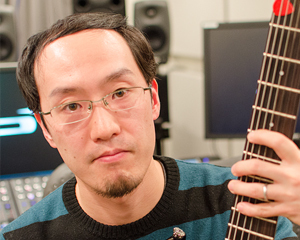 At PlatinumGames, a composer’s duties don’t stop at writing, recording and mixing music – they also take direct charge of how their music will be used in the game. They’re also responsible for the overall creation of games’ soundtracks. Quality music makes an incomparable contribution to the rhythm and feeling of a game, and accentuates the emotional highs and lows of any gaming experience. Game music often lingers in players’ memories as strongly as the gameplay itself, and holds a very special place in their hearts and minds. As a composer, you’ll have a direct hand in creating these memories. At PlatinumGames, we take our composers’ suggestions and opinions heavily into account when deciding what sort of music to use at each point in the game. Our composers carefully consider everything about how their music will be used, inspiring interesting approaches and calling for a strong sense of discernment that in turn allows them to realize their musical ideas to the fullest extent. Though this focus might appear to lead to an uncompromising, inflexible stance, we strive to respect and foster each of our composers’ unique artistic sensibilities. Focusing on these individual feelings and desires throughout composition motivates our composers, and it shows in the quality of their music. PlatinumGames provides an environment where composers are truly limited only by their own imagination. Before coming to PlatinumGames, I worked at mastering studios and composition firms, mostly creating music for commercials. Along the way, I’d occasionally get contract work to create music for games, or for background music for new games’ trailers. I first came across PlatinumGames’ audio team while looking for references for those contracts. I was quite taken with the quality and musicality of their work, and knew this was where I wanted to make music! Please tell us about your work at PlatinumGames. PlatinumGames talks about their emphasis on quality – and I assure you, it’s even stronger than I expected. Everyone on the team is extremely passionate about games. Their drive is contagious, and I’m constantly inspired by their enthusiasm. The audio team at PlatinumGames is tasked with figuring out the best ways to match background music and sound effects to the progression and contents of the game. From the moment I joined the company, I felt deeply involved in the whole creative process. Please tell us about the sound design environment at PlatinumGames. Our work environment has everything you could ask for when composing, and our software and hardware setups are constantly evolving. Once you join and get your work environment set up as you like it, you can jump right in and really focus on creating. It’s been very smooth right from the start. Above all else, I love making music. The process of creating something great through trial and error, then having others listen to it and help you make it even better, then finally getting the OK and knowing that all your hard work will go into the game is extremely fulfilling. Members of each team are very skilled, and very conscious about their work – it’s like being surrounded by master craftsmen. With so much talent in the air, I can’t help but be inspired myself. As someone who jumped into the games industry from outside with both feet, take it from me – be confident in your technique and enthusiasm! Please capture that confidence and come face exciting new challenges with us. Applicants who are knowledgeable and discerning about audio work. Applicants with strong communication skills, as our audio team communicates closely with our programmers and other artists. Game industry experience is preferred, but not required for applicants with art skills conducive to game creation. PlatinumGames is an equal-opportunity employer and does not base hiring decisions on the race or citizenship of applicants. Please describe relevant experience you have in the games industry, including detailed descriptions of your duties and responsibilities in any completed projects. Please also submit music, sound effects, MA, etc. demonstrating your audio production skills. You may submit these works in any form and in any amount you feel appropriate to give us a complete sense of your abilities. No specific content is required. We accept work examples on CD or DVD. Unfortunately, we are not accepting applications for this position at this time. Please check this page regularly and apply at a future date.